Many circles are necessary to create the traditional Pow Wow. The first circle is the circle of cedar under which the drums sit and singers gather to sing their songs. The drums are circles, too. Then there is a circle of dancers, young and old. They gently touch the earth with moccasin attired feet, in harmony with the voice of the drums. Some of the dancers enter the circle to pray. Their dance is medicine. Others enter the circle to socialize or to practice and develop their dance styles. The dancers may have one or several of a great variety of reasons for being there. At the edge of the dancing circle another circle begins. This is where the observers of the Pow Wow are gathered to watch the dancers and to listen to the drums and songs. Healing often takes place in this circle. It just happens. People reconnect spiritually, with something pure and real. Tears are often shed, tears brought forth by a renewed pride one finds again within themselves and by a feeling of humility which fills their hearts at knowing they are a human being, appreciating what it means to be thankful for untold blessings. Beyond this circle, yet another circle begins. This circle is the space where people encounter old friends. Much handshaking and hugs occur in this circle. People give news from their territories to friends and old acquaintances. They might request blessings and prayers there from trusted pipe carriers and elders, for loved ones stricken with illness back home. They might proudly introduce new family members, grandchildren or sons and daughters to people they admire from far off communities. The last circle on the grounds of the Pow Wow site is the circle of traders and food vendors who surround all. These good and talented people are so very welcome at the Pow Wow. The traders have with them, items of great beauty and of special meaning to passers-by, for sale. And the food vendors? Goodness knows, the Pow Wow would not be whole without them. Indian tacos + buffalo burgers + bannock and jam = yum yum. The last and greatest circle at the Pow Wow is the one made in the sky by the hawk or eagle. One or the other of these birds will always come to soar circles over the Pow Wow site. They are the icing on the cake. A blessing from Creator we can actually see. What a wonder. It is true the circles of the Pow Wow are many and that we all benefit in some way because of them. Our spirits soar in the energy of these circles. 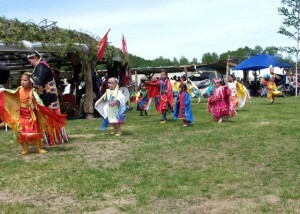 Never forget this though, the Pow Wow at Kitigan Zibi would not happen if not for the generosity of their volunteers. The volunteers are circles unto themselves. They give up a weekend out of their lives so that you and I and our families can experience something empowered to help us grow in our identity and in our spirituality. Words cannot fully express how we feel about them. Kitigan Zibi (K.Z.) goes out-of-pocket at least $15,000 a year to host their Pow Wow. There is no charge to enter. It is free because of the generosity of the people of K.Z. Let’s not take this enormous generosity for granted. Why not send an email to K.Z. expressing your heartfelt gratitude. It is not too late to do so. Check out K.Z.’s website and tell them “Kichi Migwech”!!! This entry was posted in Community and tagged Albert Dumont, circle, drum, eagle, hawk, kitigan zibi, pow wow. Bookmark the permalink.